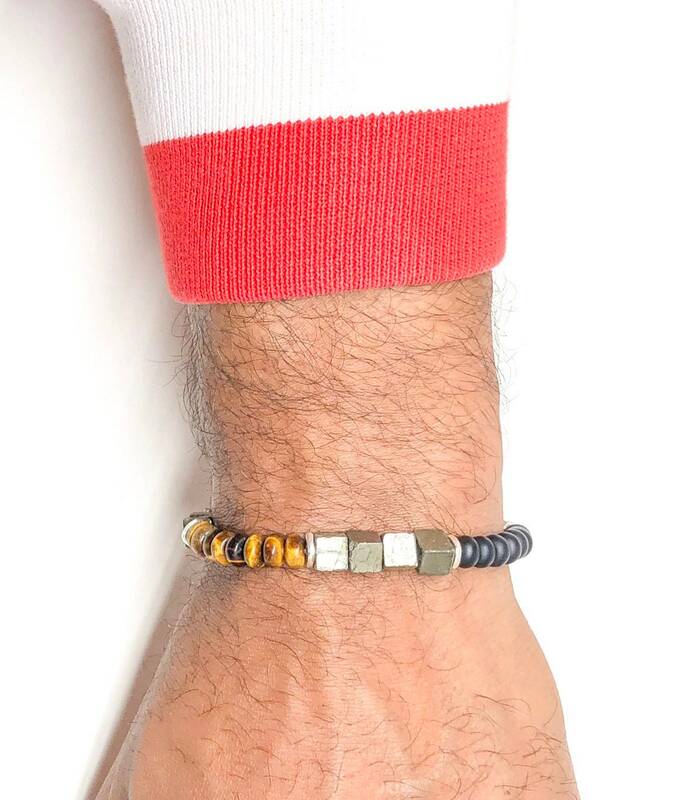 Men's bracelet with Copper Pyrite, Onyx, Tiger Eye and Sterling Silver. Men’s beaded made with copper pyrite 6.6mm, tiger eye 6.4mm, onyx 6.4mm and sterling silver spacers 5.9mm. This very unique piece is made to stand out of the bunch and make you look different. Treasured in many ancient civilizations, the Pyrite crystal stone meaning comes from the Greek word ‘ pry,’ which means fire. This fiery stone manifests male energy, that burning cauldron of passion that exists deep within the third eye chakra. Onyx is associated primarily with the root chakra. It assists with challenges in life, especially those caused by a drain of energy. It prevents the draining away of personal energy and can be used for protection from such. It also helps with grounding and controlling or eliminating excess or unwanted energies. It has been used for wound healing, childbirth and to increase stamina and self-control. Note that healing crystal meanings are spiritual supports to healing and are not prescriptions or healthcare information. Black onyx and red onyx are associated with the base (root, first) chakra. White onyx is associated with linking the base and crown chakras to have balanced energy throughout the chakra system. Other colors are associated with the related chakra by colors. Tiger Eye: is a beautiful stone whose name comes from its resemblance to the eye of a tiger. It is found primarily in South Africa. 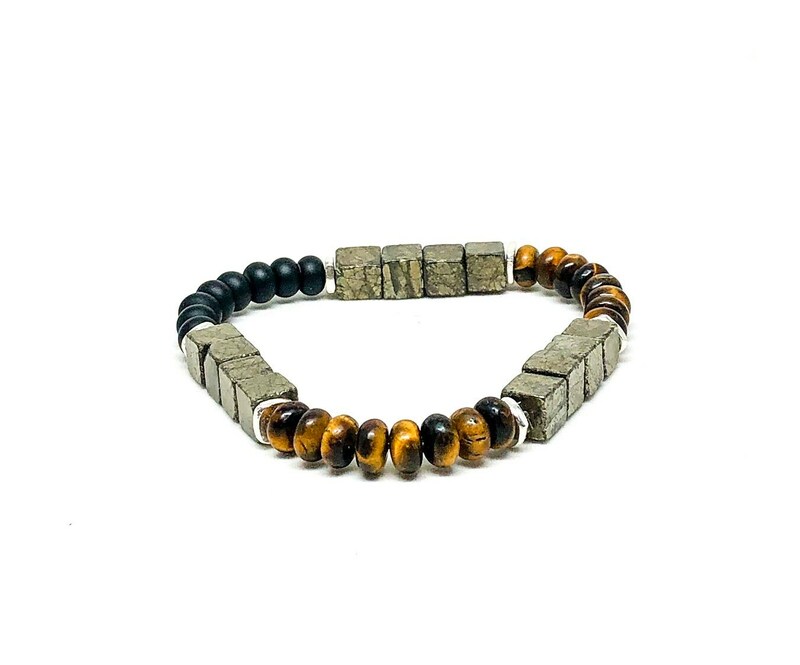 Tiger Eye is useful in relieving high blood pressure, and helping bronchial asthma, rheumatic heart disease, Otis, and psoriasis. It also has benefits for the weak and sick. 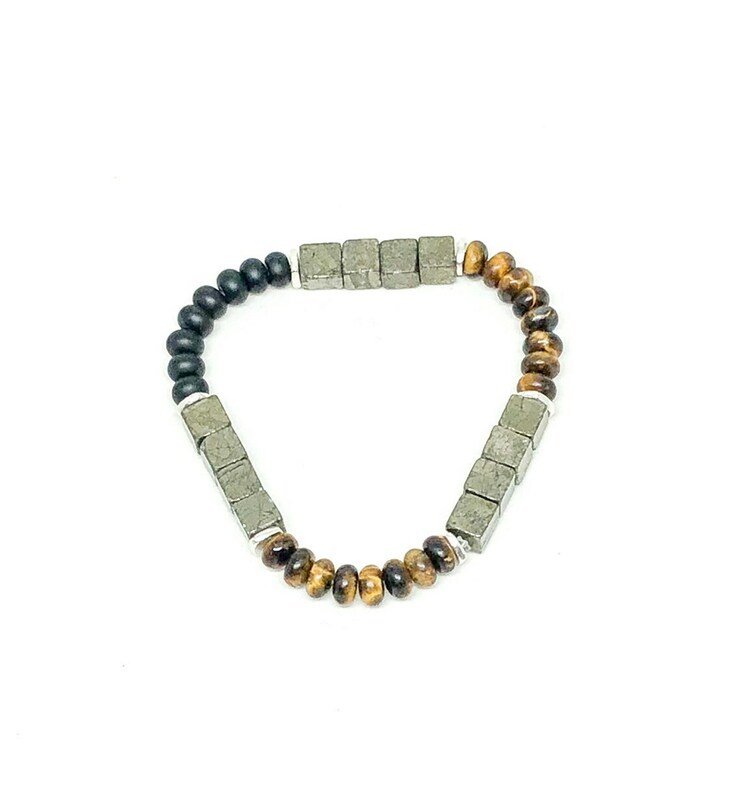 Tiger Eye's primary mystical property is that it provides mental focus and confidence. It helps you face and overcome difficult challenges and stick to your plans, despite discouraging setbacks. For this reason it is sometimes marketed as a gem that brings professional and financial success. It is also believed to protect you during your travels, because the mental focus keeps you aware of the dangers of your new surroundings and take appropriate cautions. For the same reason, Roman soldiers used to wear Tiger Eye for protection during battle. 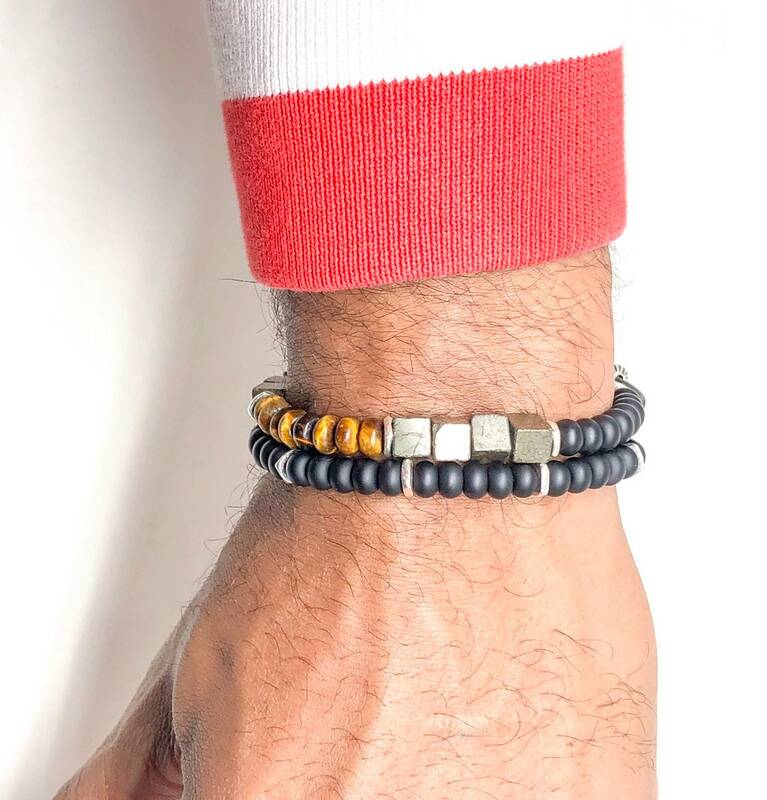 If you have the habit of giving up and backing down from your fears, and of being easily distracted from what's important, maybe Tiger Eye is the gem for you. This bracelet comes in a customized jewelry box with our logo.